I cant believe I have nearly made it to June and this is my first Monkey, I made a gorilla a few weeks ago but this is my first Monkey, he is based on a monkey made by Dylan Gelinas so thanks for that Dylan, your designs are just so awesome, I just had to add in a banana for him to nibble on. 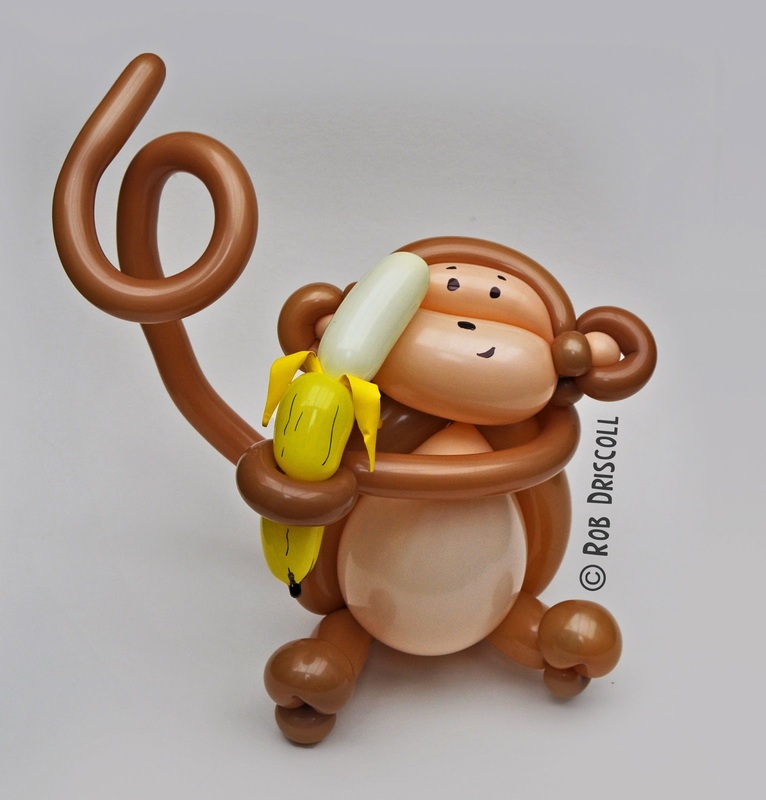 I think there are 10 balloons in use here, 2 for the banana and then the rest in the monkey, I probably spent as long making the banana as I did making the monkey. There are a mixture of balloons in use here including 260s, 160s, 350s and a 5" round. Tomorrow is Film Friday and I am quite excited about the sculpture I have in mind, it will be on display in HMV Gunwharf over the weekend. Also coming up on June 2nd, I will be doing a live balloon sculpture at the Aspex Gallery in Gunwharf Quays in Portsmouth, it is to help celebrate the Camp Bestival Around the World Tour, between the hours of 11am and 2pm I will be creating my biggest sculpture of the year so far, there will be lots of other activities going on in the gallery and I will update you on those nearer the time.